I’ve been giving some thought to one particular way I might solicit some donations and I’d would like to get your thoughts on it. I’ve been toying with the idea of running an online raffle to raise money for the event. It is an idea inspired by John Chow’s link-building contests, but in my case, I’m more interested in raising money for breast cancer research than I am in promoting this blog. I’m thinking of making the prize an iPod nano — a pink one, in keeping with the pink ribbons associated with the cause. If I had to guess the first rule about running a raffle, it would be that the prize has to be worth winning. Those iPods seem to be universally adored, so I think I’d be safe with one of those. Here’s how I’m thinking it would work. Make a donation – I’m thinking there would have to be some minimal donation for entry in the contest. An amount of $10 comes to mind. Spread the word by blog – A blogger could enter the contest by writing post about the raffle. As long as the post met some minimal criteria, like including a link to the contest page and another to my donation page, the blogger would be entered into the contest. I would supply some boilerplate text to make this easy to do. Spread the word by email – Non-bloggers could spread the word and enter the contest by forwarding an email about the contest to at least X others and copying me on it. I’m thinking 5 might be a good number for X. I’m feeling a little hesitant about this part of the contest because it kinda feels like spam, but I want to give people who don’t have websites a chance to enter. What do you think? One of my biggest fears is that I’d have plenty of people the word (since it’s essentially free) and nobody making donations. To make the donation option more attractive, I’m thinking I’d have donations count for two ballots in the raffle and word-spreading entries only count for one. I recognize that there is a built-in disincentive to spreading the word, since it opens the possibility to more ballots entering the contest and reduces the likelihood that the spreader will win, but I’m not sure that it will be enough. Another problem that I worry about is that email word-spreaders will try to beat the system by forwarding email to garbage addresses. I thought I might reduce this problem by warning people up front that I intend to check any potential winner by writing to the email addresses to which the message was forwarded and confirming that there is a human (or something that sounds human) on the other end. Of course, this doesn’t stop scammers from forwarding all the copies of the email to themselves, using a different alias for each copy. One of my other concerns is that by turning my fund-raising into a contest for personal gain, I might be robbing potential donors of feeling they are good people. It seems to be setting up a perfect situation for an internal moral conflict: am I good person for giving to a worthy cause or a bad one because I want to win an iPod? I’m afraid it could backfire and paralyze people from doing anything. What are your impressions? Would you participate? How? Any suggestions for how to set up the numbers for the contest? How many ballots would you enter for donations versus word-spreading? How big of a donation would require? How many emails would you require to forward? Finally, are you interested in donating an iPod for the raffle? I’d make sure to have your name (or the name of your company) gratuitously plastered on all the related material. It could make for a good promotional tool you or your company. Email me if you’re interested: kd@kendyck.com. Originally uploaded by hablando del asunto. I recently finished reading Ross Russell’s Bird Lives!, a biography of Charlie Parker, the legendary jazz saxophonist who revolutionized the world of jazz in the early 1940s. One of the things that surprised me on reading the book is just how unremarkable Parker was as a young musician. We all hear stories of young Mozart; how audiences were astounded by his musical talents as a child. Mozart seemed to have some inexplicable innate musical from the moment of his birth. He was relatively late coming to music. He didn’t pick up an instrument until he was in high school. When he did, all accounts indicate that he was awful. For years he was considered a joke amongst his local Kansas City musicians, if they noticed him at all. His tone was terrible. He didn’t have any real understanding of music theory or harmony. He just plain sucked. But what he might have lacked in raw talent, he more than made up in dedication. He spent every spare minute practicing. Despite several demoralizing incidents at local jam sessions — all of his early attempts to solo in public ended badly; one with the drummer throwing a cymbal to the floor to get him off the stage — he continued practicing. He was determined to master the alto sax. He did eventually, of course. 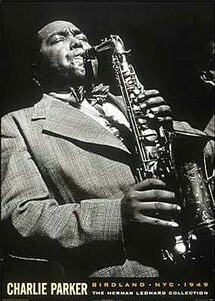 He spent a summer learning to play the solos off some Lester Young records and learning music theory from other trained musicians. Slowly he became competent. Then he became good. He kept working at it until he became the great player that history remembers him for. I’m not suggesting you can consider Charlie Parker a typical example of anything, but his experience does seem to support what Kathy is saying.